Drum lessons for Kids and Adults in Seattle! 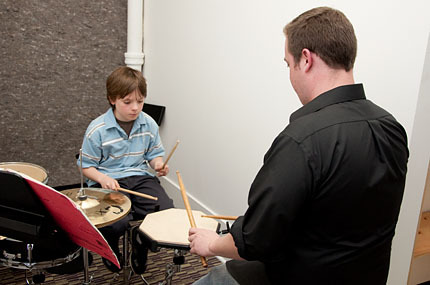 We offer a wide variety of drum lessons or percussion lessons. Most of our students learn on a drum kit. We have both male and female students and typically do not start drum lessons before age 8 as students need to be able to reach both the pedal and the high hat. We do have some younger students but suggest they come in for a trial drum lesson to see if they are big enough to get started. Drum lessons are taught on a drum kit in our studios but students are able to get started practicing at home on practice pads before purchasing or renting a drum kit. Our drum lessons stress proper technique so students become good drummers quickly. Our Drum instructors have degrees in percussion, so in addition to teaching how to play on a kit, they also teach reading music notation and theory, which is not always common.